Normally, I would resist commenting on wealth, but I love numbers, and there has just been a wealth of data released on wealth. We start with Forbes Magazine, which lists 1426 world-wide billionaires, with a net worth of $5.4 trillion dollars. 442 of the billionaires are in the US. As an interlude, the LA Times cites a study that the average US CEO of a large company earns 350 times that of the average employee of that company. In the 1980’s, the rule was that 20 times the average employees’ salary was considered ethical. To see what this amounts to, the average wage in 2011 was about $43,000. Multiplying by 350 gives $15 million for the average CEO salary. Although the LA Times doesn’t refer to what companies gave the 350 times figure, later it refers to a study of the top 250 out of S&P’s 500.
Credit Suisse has just released its 2013 Global Wealth Report, figuring World wealth at $241 trillion, and US wealth at $72 trillion. 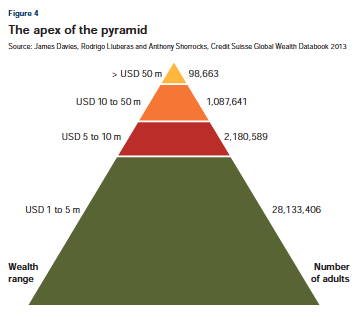 They show adult wealth on a pyramid plot, where the left side is per capita wealth measured in factors of ten, from below $10,000 to over $1 million. The areas of the pyramid are proportional to the number of people between each pair of levels. Here is the plot containing all adults. Since the top layer only contains millionaires, and we started discussing billionaires, we must peer further into the top layer. Rather than compare percentages here, we just note that the top layer only gets us into $50 millionaires, of which there are almost 100,000. The 1426 billionaires would form a rock containing only 1.4% of the top yellow brick. 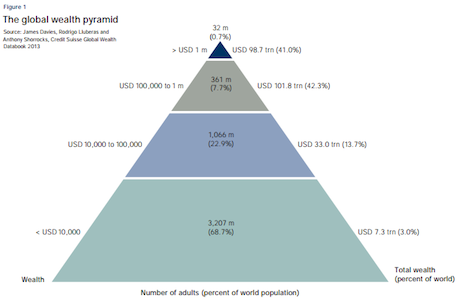 There are 4.6 billion adults in the starting pyramid out of 7 billion total population. The above $50 million layer contains only 1/46,000th of the world’s adults.